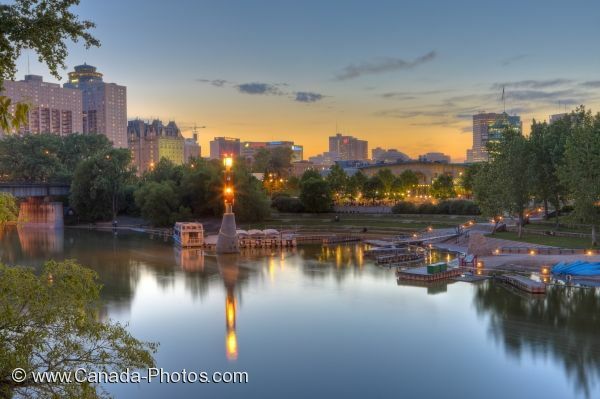 The waterfront comes to life as the lights illuminate the marina, market and tower in The Forks in the City of Winnipeg, Manitoba while the sunset lighting starts to fade. The bright yellow lights which highlight The Forks as the sunset hues begin to fade and the onset of darkness takes over, are beautiful along the waterfront of the Assiniboine River in the City of Winnipeg, Manitoba. The waterfront consists of a marina, a pristine hotel, a park and various tourists attractions. Picture of a beautiful sunset over the waterfront at The Forks along the Assiniboine River in the City of Winnipeg, Manitoba.